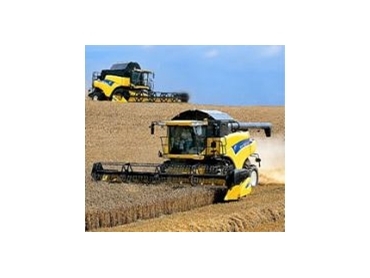 The New Holland brand continues its trend of offering break-through technology to its customers with the 2005 model CR combines offering a range of significant upgrades that deliver greater capacity, less grain loss and clean, undamaged grain. Today’s larger heads have greater lift and speed-of-lift requirements. A factory installed, heavy-duty head lift cylinder is now standard on the CR960 and CR970 models. It includes one 70 mm left-hand cylinder and one 75 mm right-hand cylinder to raise 94C39G / 94C42G draper heads. The ASP™ (Automatic Stone Protection) system has been modified on new models in response to customers reporting ASP™ false detections which occurred primarily when harvesting high yielding cereals. The noise generated by crop can cause a false detection. To permit processing of large amounts of material without crop noise being a factor, a new system replaces the high, medium and low setting, with a number ranging from 0 to 100 in increment steps of 10. This new system means that operators can now fine-tune the setting to provide adequate stone protection with minimal false detection. To produce a wider and more evenly distributed residue spread, new 2005 CR combine straw choppers are equipped with spread enhancing knives. This is particularly beneficial for Australian conditions where large heads are commonly used. When moving from chopping to windrowing, chaff spreader removal is recommended. Simple, no-tools conversion from chopping to windrowing is now possible, with quick couplers replacing valves for the in-feed roll shut-off drive circuit. To reduce the chance of a leak, engine oil filters on the CR960 and CR970 models have been relocated to the front-side of the engine. Servicing is now easier, with oil filters serviced through the grain tank access panel and drain tube valves in the bottom of the engine oil, hydraulic reservoir and PTO gearbox replaced by plugs. Engine oil service intervals are 12 months or 600 hours – typically once a season for most owners. For greater durability of components, CR models now feature a sealed pressurisation fan motor, spliceless rotor drive belts and a relocated starter relay. The new spliceless rotor drive belts’ improved rubber compound is capable of carrying higher torque spikes and offers greater resistance to cracking and high temperatures.